The last of November 2012, Chad & Katie flew back to Independence, KS to pick up our new Super Truck and drive it home. It’s a Chevy Cutaway Chassis with a Hackney Plumbing Box on the back. We’ve been so excited to get this New Super Truck ready and into operation, so that we can more efficiently serve our customers in the Treasure Valley. With only one Super Truck, we spent a lot of time on the road traveling from one end of the valley to the other. Now, with two Super Plumbing & Drain Cleaning Trucks on the road, we can serve our customers on both ends of the valley more efficiently, timely, and professionally. We designed a new vehicle wrap that matches our website and is easy to recognize for our customers. This New Super truck is equipped with two sizes of Sewer Cameras, three sizes of Drain Cleaning machines, and all the plumbing parts and supplies needed to better accommodate the needs and issues of our customers. 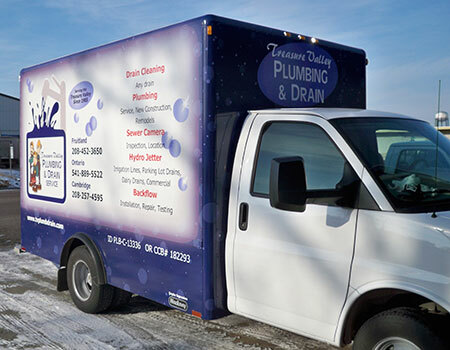 Cody and Jerimiah are the Service Techs on this new truck, and they have the experience and expertise to solve any Plumbing and Drain Cleaning issue you might have, in a timely and professional manner.